The team at Gallerian! The shoppers were VERY confused! Today, Christina's workshop participants played their final two concerts. Each student played a rag on xylophone while the others accompanied in a marimba band. 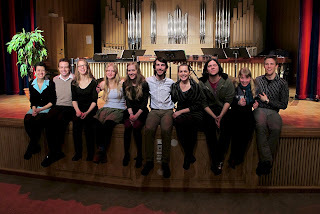 We played THREE concerts today - one at the Krokodil Café, one impromptu performance at the Gallerian shopping centre next door and finally an evening performance at Framnäs Folkhögskolan's Aulan Hall. It was super fun and we had a great time hanging out with all the students. 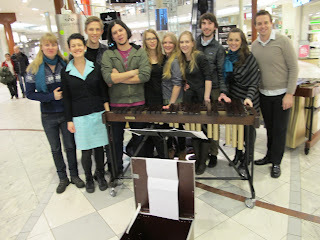 It was wonderful to all work together towards something fun and have a great time with music! The team at Framnäs - what a great concert!